Before Acting Attorney General Matt Whitaker was even done testifying for the House Judiciary Committee, Palmer Report wrote that he had already committed perjury during his testimony, and that he was very likely to get rung up for it. Sure enough, the Chairman of the committee just did precisely that. In a development that’s entirely expected yet nonetheless stunning, House Judiciary Committee Chairman Jerry Nadler has published a letter to Matt Whitaker, informing him that he’s been nailed for felony perjury. When Whitaker claimed under oath that he hadn’t discussed the Robert Mueller probe with Donald Trump, Palmer Report predicted that proof would soon surface that they had in fact discussed it. It’s not that we had any inside information or a crystal ball. It’s just that the Democrats had zeroed in on this question in a manner which suggested they already had proof, and they were merely daring Whitaker to lie. So what now? Jerry Nadler’s letter to Matt Whitaker says that the committee has “identified several individuals with direct knowledge of the phone calls you denied receiving from the White House.” For the moment, Nadler is merely asking Whitaker to come back and “clarify” his answers under oath. This is, in effect, an offer to maybe not send Whitaker to prison, if he promptly comes back and tells the incriminating truth about Donald Trump. The ball is now very briefly in Matt Whitaker’s court. If he doesn’t immediately to come back and tell the truth, Jerry Nadler will ring him up for felony perjury. If Nadler doesn’t feel that referring Whitaker to the DOJ will get the job done, he can simply turn Whitaker’s transcript over to Robert Mueller, who can then indict and arrest him, and push him to cut a plea deal against Trump. 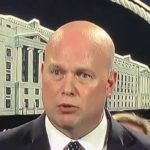 Either way, the point is to get Whitaker to sell Trump out, as Whitaker is a peon, and Trump is the real target.